Hi! My name's Catherine, I'm 22 and live in a little town up north! I started my blog at the same time as my little online shop, when I was 19. At first it was all things vintage and more of a lifestyle blog, but progressed into more beauty and style as I got a little older, as well as just recently starting doing youtube videos! My blog name is taken from my online shop, which is 'lace and liquor vintage'. An old friend came up with it when I was 18 and contemplating starting to sell on ebay, and I actually really dislike the name now but as people know my shop as it and my blog as 'lady liquor vintage', I think I'm stuck with it now! Most definitely in charity shops. I'm constantly in them sourcing stock, so I buy the majority of my clothes second hand. I'll also treat myself to a couple of new bits at the vintage fairs I sell at, if I've had a good day. Other than that, I love Topshop, ASOS, and H&M. 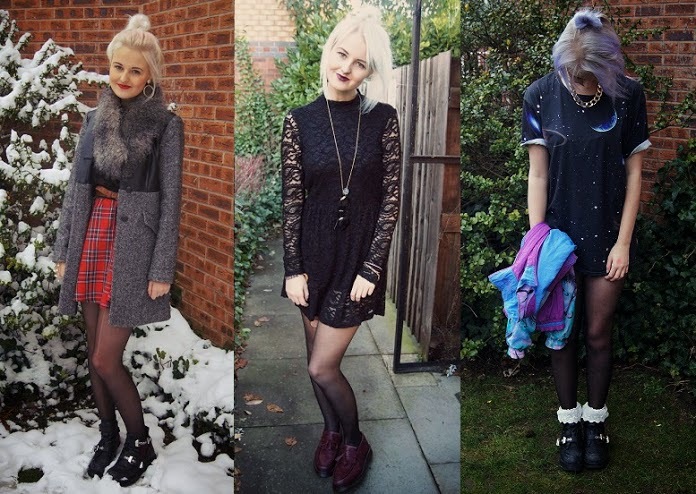 My style icons are mostly bloggers, they're definitely who I get most of my inspiration from. I also love all the old classics, like Jane Birkin, Francoise Hardy, and Bridgitte Bardot. I'm definitely an old fashioned girl through and through, and my all time favourites are David Bowie and T-Rex. I have a pretty big vinyl collection which I'm always adding to. I love the like of Leonard Cohen, Fleetwood Mac & The Cure too. 'The Slider' or 'Jeepster' by T-Rex are some of my favourites, 'Golden Years' or 'John, I'm only dancing' by Bowie too. Hi! I'm Lydia, I'm 21 from Sheffield & live in Leeds while I'm at uni. I started my blog about 18 months ago, mainly because I was feeling a bit down about things & wanted a little hobby to perk me up! I don't really know! I just wanted something with 'fashion' in the title that I wasn't going to regret a few years down the line.. so far I don't! I spend most of my money in H&M, so much so that it's rare you'll see an outfit post where I'm not wearing something from there. They always have up to date trends and I don't think the price is bad for the quality. 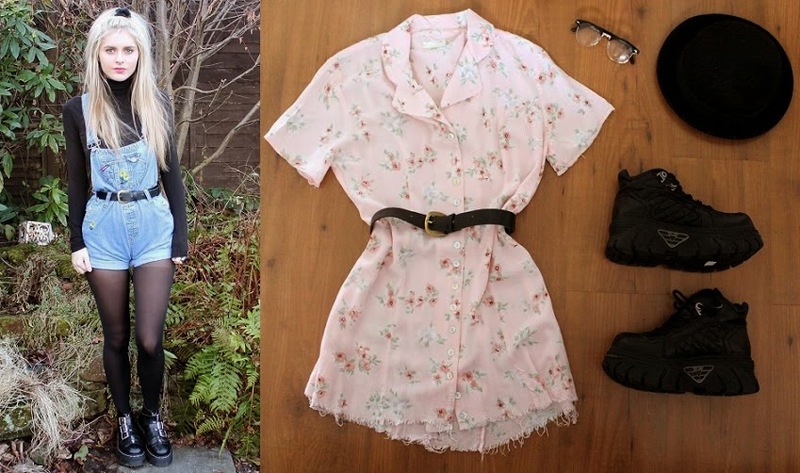 I get a lot of bits from charity shops, you can find similar stuff to what they have in Topshop, minus the £30 price tag! My style icons are usually bloggers. I prefer to look at how they style things up as I think it's usually more realistic than what you see in magazines and on celebrities. Oh dear, my taste in music is tragic! At the moment, I end up with The Saturdays - What About Us stuck in my head for days. It's the most annoyingly catchy song ever! My Dr. Martens, not really a recent thing as I've worn them non stop since I got them! Heyyyyy Kitties, I'm Jess and I currently live in the very uninspiring town of Hemel Hempstead which is just outside London. I'm currently a Fashion Marketing student at Northampton University and graduate in just 5 weeks eek. 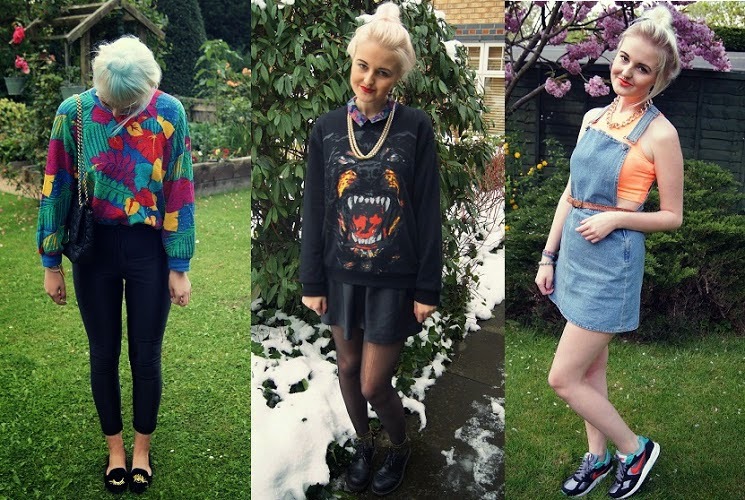 I'm 21 and decided to start my blog as an online outfit diary. I then surprisingly started discovering that people were actually quite interested in what I wear/buy and so continued. I would have to say eBay is where I actually buy my entire life, it's full of anything and everything you could ever wish for. Brand wise, I love Unif's slogan tees and Evil Twin's collections for a grungey twist. On the high street I occasionally shop at Urban Outfitters, it's cool but over priced. C'mon now £12 for a pair of glittery socks, pah. Apart from that my savior is the good old car boot sales in the summer. I literally might as well set up camp in the field to get the best bargains. 50p for like the coolest vintage granny sweatshirt EVER? Thank youuuuu very much. Most of my favorite items in my wardrobe have been boot sale bargains! At the moment, I can't stop listening to the Yeah Yeah Yeahs - Sacrilege and PEACE - California Daze. Do my Jeffrey Campbell Coltranes count as an item of clothing? They are actually glued to my feet, they go with absolutely anything and grunge up every outfit I own. Love these interviews! What a great idea! Good choices too! Thank you :) they're all lovely girls! btw, want to win a gorgeous boho maxi dress? just enter the giveaway on my blog! Aww, I hope you find some nice new blogs to follow! i love all these babies!! Haha she is isn't she!? Thank you :) they're all great blogs! I love posts like this, means I can check out other bloggers too. Yes I hope you find some new blogs to follow!